Foothill Ranch, CA - The BH Group announces that the French BH Sojasun cycling team has received the official invitation to participate at the upcoming Tour de France, held June 29th in Porto-Vecchio for the first stage and ending July 21st in Paris, France. This merited invitation is even more rewarding as it marks the centennial celebration where team BH Sojasun was selected as one of three wild cards. BH Sojasun will join the 19 Pro Tour teams, forming a group of 22 elite world-class cycling teams. The organizers of the Tour granted a wild card award to the BH Sojasun team for their outstanding performance in the season; obtaining three triumphs with noted cyclist, Jonathan Hivert, an overall victory at the Star of Besseges, and two stages at the Ruta del Sol, and the recent overall fourth place finish at the Maxime Mederel, Tour of Turkey. 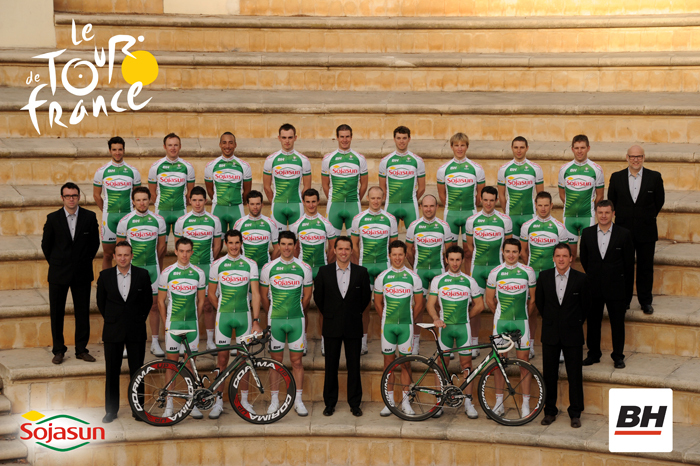 “The BH Group and BH Bikes are proud to co-sponsor the BH Sojasun cycling team. We are excited to be their official bike sponsor and supply them with an Ultralight for performance and precision in the mountain stages and our handmade carbon G6 with aerodynamic power, which is ideal for flat terrain. With over 100 years in business, BH has a history with Tour de France and it made sense that we would be back with a team for the centennial year. We have an extremely talented team of riders, and it’s going to be an exciting race” said BH Bikes CEO, Steve Lindenau. The enthusiasm of being part of the Tour de France is shared, and celebrated, with the French BH Sojasun team directors and cycling team, as they have met their objective for the year: to participate at the Tour de France; known as the most prestigious cycling race of the world. The BH Sojasun general manager, Stephane Heulot stated, “Above all, this is recognition of the efforts and success of the group, and of the work carried out over several months. We are honoured to receive this achievement and are very grateful to the ASO, organizers of the Tour de France. Now, we have to look towards the future and demonstrate that we are worthy of this award and look to leave the BH Sojasun stamp throughout the race." The BH Sojasun team trainer revealed a clear objective: “A stage victory would be magnificent, and we have the potential for that. Above all, we are a great team; everyone contributes and if anything; we are famous for being fighters and daring. A victory would be a wonderful compensation for BH Sojasun, who continues to be a loyal partner with great recognition, and without them this great adventure would not be possible." BH Bikes is one of Europe’s most prestigious bicycle makers and have built the brand into one of the most established and successful in the world of cycling. Since our inception, BH Bikes painstakingly engineers, designs, tests and builds bicycles that climb with ease, descend with confidence - always putting rider performance and comfort out front. It's no wonder BH Bikes won the first Vuelta a Espana in 1935, and has won it six times since. BH Bikes has also enjoyed carrying the yellow jersey for eight straight stages in the 2009 Tour de France. Today, BH Bikes capitalizes on a history of more than 100 years of setting performance standards in an industry inherently driven to innovate what we ride and race. BH Bikes has developed a specific line of higher performance bicycles that are lighter, stiffer and more ergonomic than the competition. We manufactured the first monocoque carbon frame weighing less than 800g, placing our frames among the lightest and most efficient in the world and creating a new category - Ultralight Bicycles. For more information visit www.BHBikes-US.com.